The ‘Summit for the Future’ is organized on an annual basis by The Club of Amsterdam. It brings together international Thought Leaders to discuss significant, global challenges and opportunities. In 2006 it focused on the subject of risk and the role of risk in society, innovation and global growth. Without risk taking there is no progress, no growth and no prosperity. The Summit provided an occasion to reflect upon the role of risk in enterprise and society, on how the global spectrum of risk is changing, and on the acquisition of new tools and thinking to harness risk as a force for growth in the future. The music sector in Germany is going through major changes. Global technological and societal trends combined with major cuts in public spending for the cultural sector need to be faced. Right now these upcoming changes seem to be met by agitated melancholia instead of orchestrating these changes to a desired state of the future where music is established as an energy source for societal and personal development. The time to refer to the glorious German music transition rectifying public spending for ‘high quality’ music seems to be coming to an end. The border between different music lines has become more and more blurred. 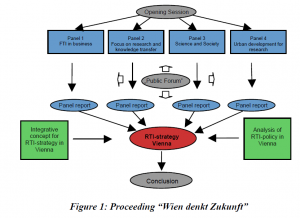 The SCOPE 2015 Project, which was conducted during 2005, sought to demonstrate the utility of foresight to EC policy makers and others concerned with RTDI cooperation with developing countries. The project was small in scale but big in ambition, covering four regions of the world: countries of the Commonwealth of Independent States the CIS states excluding Russia, Latin America excluding Brazil, Maghreb and Mashreq, and Sub-Saharan Africa excluding South Africa. 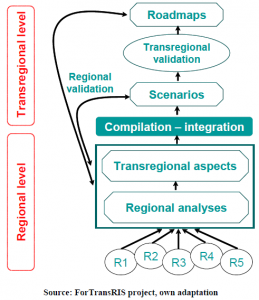 The specific purpose of the project was to produce ten-year scenarios focused upon contextualised scientific and technological developments in selected regions of developing countries with a view to drawing implications for European RTDI cooperation policy. The project was led by PREST of the University of Manchester in cooperation with three partners: CKA of Belgium, the Malta Council for Science and Technology, and the Steinbeis-Europa Zentrum in Germany. The main aim of the eForesee project “Biotechnology Foresight in Estonia” (2002-2003) was to help develop innovation and industrial policy measures and elements in order to create long-term (10-20 years) possibilities of sustainable growth in biotechnology and related industrial sectors in Estonia. It focused on the development of institutional, economic and legal measures for the creation and sustainability of biotechnology as a new paradigm leading industry; through these measures, the management of various economic, developmental and social ‘side- effects’ – due to the development of biotechnology within and outside Estonia – were also achieved. Funded by Regione Lombardia and implemented in collaboration with Technocora, this initiative takes up where the EU funded Fo-MoFo projet left off in 2002. The title ‘FoMoFo’ is a reference to the Four Motors of Europe, a group of highly developed regions that drive European industrial production. Along with Baden-Württemberg in Germany, Catalunya in Spain and the Rhône-Alpes region of France, the Italian region of Lombardy counts as one of the four motors. This article reports on an initiative that builds upon the FoMoFo foresight pilot to develop a deep understanding of the future for industrial production in the Lecco region of Lombardy. The food sector is one of the most important industrial sectors in Flanders. The aim of this foresight exercise was to identify and map future scientific and technological developments in the food sector from a socio-economical perspective and to identify future needs for industry working in the sector. The outcome of the study directly feeds into the strategic policy making process of the Flemish Government. At company level the aim is to provide managers, R&D managers and researchers with a ‘window of opportunity’ through which to ‘benchmark’ their own company strategy.